Hubby and I worked together today to put the next two layers into this new coming hedge row. We have been working on this 40 foot by approx. three foot bed for a while this spring.. first we have to cut the area down a few times, going from our highest lawn mower setting to our lowest, a number of wheel barrels of raking done to clean it up, some digging and pulling of certain roots from some plants..
We already had some plants in there.. some have been planted three years, others two years and some just this spring.. we have Saskatoons, Blueberries, Smoke Bush, Gooseberry, Current, Comfrey and BeeBalm. Then we laid out the logs, then bedded it down with 4 to 6 inches of old already well started moist composting old hay square bales done into chips..
Then we filled the middle with a mix of soil and five year aged compost from the farm, to which we back filled the lines between the hay and planted into it a mix of annual flowers, Annual food plants including Squash an Peppers, and others that will come back year after year including Ground Cherries and Cosmo’s. 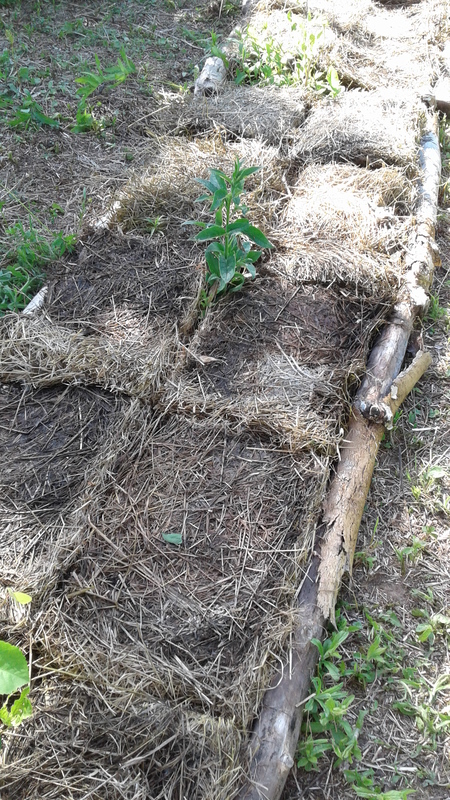 The key is that you need to put your dirt down that split in the bales and plant deep enough into it, that the roots will go have both the new dirt-compost but will also have the cooler from the cover and will shortly be able to reach the soil under it and sink in deeply. I still need to come back and tuck in dirt and beebalm and mints on the outside edges.. But the push on this garden is done for the year.. now we water, weed a bit and let it settle and do its thing, filling out and growing up etc. 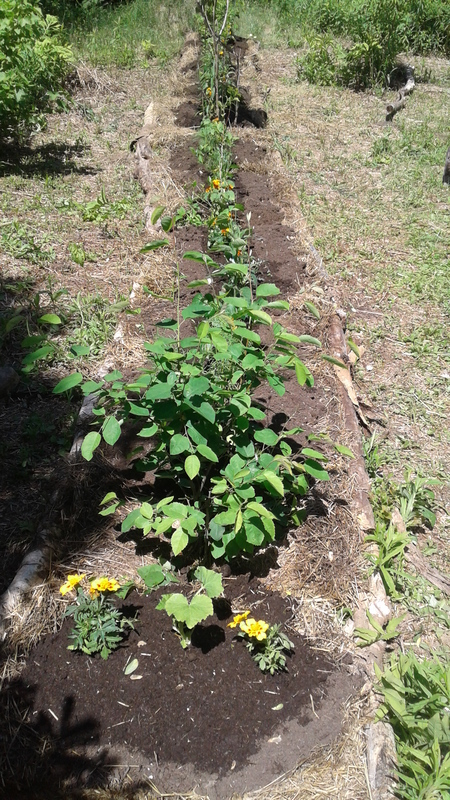 This entry was posted in Garden, gardening and tagged Food Hedge Row, Layered Food Hedge Row, Making a new garden area, No till Gardening, Permacutlure, Using Permaculture on the farm, Using your homemade compost. Bookmark the permalink. Thanks Widdershin, I will get better at them if I do them more lol. I can’t wait to do follow up on this new bed, I think its going to be looking really good by the late summer and early fall. I have started lots of borage babies that will be transplanted out in the border edging along with other plants that will help fill it in.. but not before the middle row gets that settle and growth time. I love this so much! I have ripped out the grass and some mature bushes that had come down with a fungus. My plan is to put in a few foundation plants and surround this with both edible and bee friendly shrubs. I’m so sore today I can barely move, but we got one big job done, and plenty more to go. Thank you for such an inspiring post. Hi Maria, that is a lot of work for sure, your body has a right to be sore 🙂 sorry to hear about the fungus but I will look forward to seeing your posts on your new area. I am looking at building some native bee hotels for this area. Glad you liked it.. Always work to put down a new growing bed so worth all the work. Looks great. 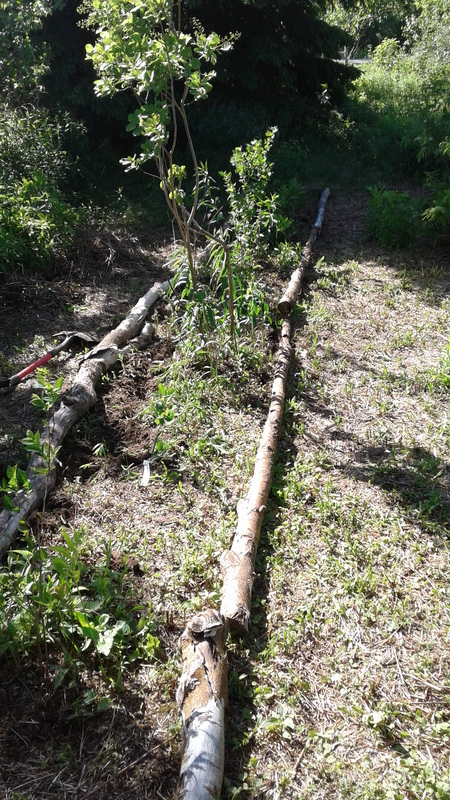 Thanks so much Candy, I was a touch surprised at how many golden rod bigger root clumps we needed to dig out, while I did leave some of the native bee’s on the other edge of the tree’s I would prefer to put asters into this new bed for the later fall bee food. Lots and lots of golden rod in the wild zone.. but I am still going Asters for this one area as I want the fall color, but there are few golden rods in there as well.. I just don’t want them to spread to much. Good to know about the pink and purple: ) Sadly bees are COMPULSIVE and will keep harvesting as long as they can; and they will harvest from anything – especially in the Fall – even though they don’t even like to eat it:/ (I’ve seen crystallised Aster honey still sitting in the capped combs when you open the hive up in the Spring… While they’re busily filling up the empty comb all around it… The only way to get it out of the hive is pull those frames and swap out for new so you can cut out and melt down those Aster-filled combs. Silly Girls! I have to fence a garden area because of the deer pressure here. There’s almost no hunting of them now on the island, and rarely a predator, so the pressure gets pretty intense once they have their babies about now. I have started putting in a few bits in wire cages, but am thinking that this kind of bed will work really well along one of the fence lines. I know they will nibble anything that escapes through the wire, but they are here anyway, so I’m not attracting them. I love the idea of not digging and planting the bones of this one time, then just a little replanting of annuals each year. 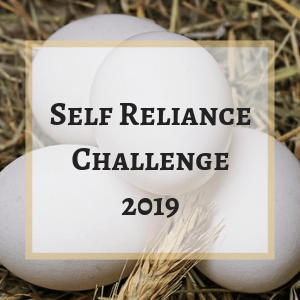 Kale and dill have been good repeat performers for me. I grow radish for pods and seeds, so this year I am going to let some self seed, and see if they want to join that club. Starting again in a new yard is very interesting. I have to say I am not missing all the slopes from the old place!